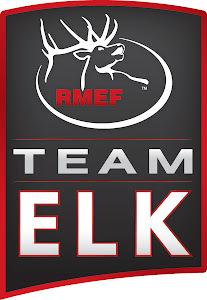 As a kid I used to laugh at my dad when he would pop in a VHS tape watching Elk being taken on camera while practicing using his rubber band cow calls and grunt tube in our living room. His eyes would bug out, face reddening from blowing on the old calls making for a comical evening. At that point in my life I had no comprehension that what he was practicing would actually draw in a fervent bull Elk during the rut. I watched my dad’s living room practice sessions pay off during a public land, DIY Elk hunt in Idaho. I was 13 years old when my dad used his old school bugle to chuckle in a spike and 5x5 bull Elk. The 5x5 came in screaming, chasing off the spike, and angrily charging towards us when my dad shot him from roughly 30 yards away. 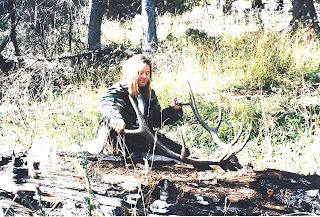 At 13 years old, watching this bull come in screaming changed my life and lit the fire for my love of Elk hunting. 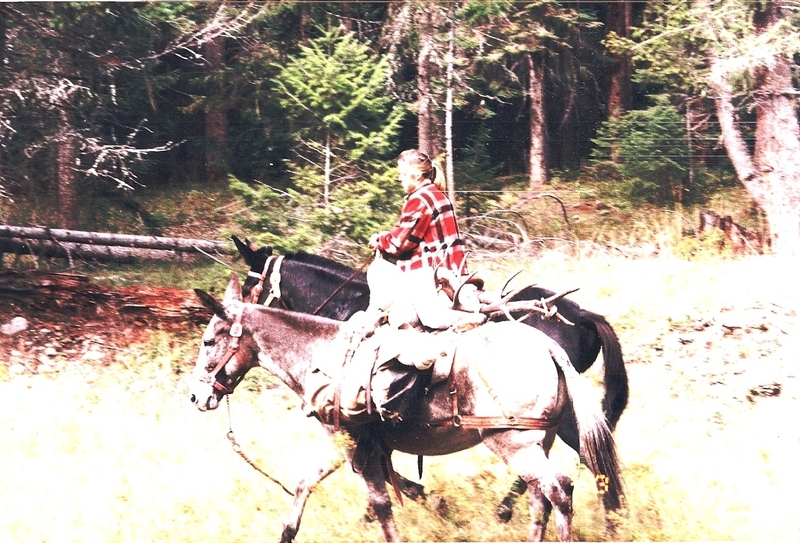 I was proud to lead out Sam (the mule) who was loaded with the beautiful bull that my dad and I had taken. Since then, I have always looked forward to final days of archery Elk season that typically hold the promise of frenzied bulls aggressively seeking cows. Having passed on countless cows, spikes, and four young branched bulls already in the season, I had only nine more days to put a mature bull on the ground, no easy feat, especially on public land and DIY. The temperatures were nearing 80 degrees every day. The hot and dry conditions were limiting hunting hours to the first and last thirty minutes of daylight. With other public land hunters targeting one of my best areas, dad and I decided to walk in to another one of our better spots under the cover of darkness. Waiting for daylight to crest over the horizon, we glassed from the timbered edge into a large feeding area with the hopes of spotting a big bull on his feet before returning to his bed. The plan was perfect. We spotted two bulls right away, a spike and a young 3x3 branched bull. Wanting only to get some video of the bulls, my dad set up on the edge of the timber doing a series of cow calls. The two young bulls came in silently, literally running past me at 40 yards making their way to my dad. Had we not have known the bulls were there we would have probably been run over by them. Somehow, along the way I accidently deleted that video clip of the 3x3 running past me. Video or no, it was a fun experience. While we were hunting this spot, the other public land hunters had spooked a nice 5x5 off of one of the wallows where I had a tree stand hung. I avoided hunt this spot in the mornings as the wind blows right down to where the bulls bed and come to water. You can see from my trail camera video that when these other hunters headed down towards the wallow, the bull gets nervous, looks around and decides to get out of there, fast. Dad and I hunted together in the morning without much luck. The bulls weren’t bugling and the hunting pressure was intense as there were at least two other groups of public land hunters after the same Elk as me. Dad had a trade show to attend, so I was on my own for the next three and a half days. That night, I set up in the same feeding area that dad and I had called in the silent 3x3 and spike with the hopes of getting on a bull when he left his bed for the evening. Doing a series of cow calls and bugles a bull finally answered from his bed when he got up to go feed around 7:00 PM. Having less than thirty minutes to get this bull within range before darkness settled in, I set up the decoys in the feeding area. Not one but two bulls came in, both hanging up around 80 yards and whining from below me wanting to come in closer but apprehensive in doing so. I didn’t get a look at these two bulls as my thirty minutes of daylight ran out fast. I made the hour long hike back to camp in the dark glad to finally have heard a bugle and feeling hopeful for the next day. The trail camera pictures that I had been getting of mature bulls going to water to either drink or wallow were all in the morning before 10:00 AM. With 80 degree days it seemed the bulls wanted to get cooled off and muddy up to keep the bugs down before bedding down for the hot of the day. With that in mind, I left camp an hour before daylight with temperatures already so high that I was in a tank top. I headed out with the plan to sit one of the wallows that had been getting used by bulls intermittently. At daylight I found myself less than 100 yards from a huge herd of Elk with one angrily screaming bull and a second bull letting out a traditional locate bugle. Unfortunately, the wind was in favor of the Elk. I had to back out of the area before they got my wind and busted me. The bulls quit bugling 30 minutes after daylight and bedded down on private land that I did not have permission to hunt. Knowing where the Elk were, I felt good about my chances for the next day as I also had not spooked them out of the area. Once again I headed into the same spot an hour before daylight. This time I dropped down below where the Elk had bedded on private land the morning before so that I could reach my tree stand before daylight. The plan was almost perfect. The bull dropped down to move his cows as they fed above me towards their bedding area at 90 yards. Unfortunately, he did not come down within bow range and the terrain was too open for me to make an attempt at a stalk without being busted. I spent the remainder of the day at the wallow with the hopes that the bull who was now bedded on private land less than 200 yards away would get hot and come back to the public land side to wallow. With time in the season growing short, I spent the next morning trying to get a bull to locate without any luck. When the wind was right, I went back to the wallow where I had gotten into the herd of Elk for the past two mornings to check my trail camera. The herd had been in to water at midnight which confirmed my belief that the Elk were nocturnal except for the first and last thirty minutes of daylight. 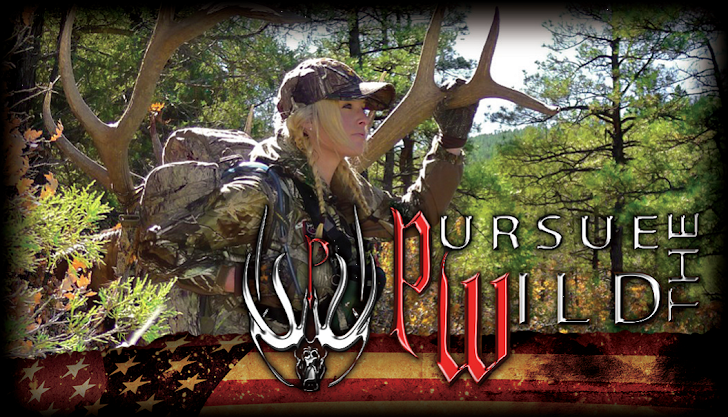 Oftentimes success in hunting comes from being in the right place at the right time. On day four, I was not fortunate enough to be in the right place at the right time; my dad on the other hand who had just returned from his trade show, to hunt Mule deer had the luck that I wished I was having. Heading up the timber ridge, daylight had just crested the horizon, when my dad accidently rolled a rock down the mountainside just as he spotted his first glimpse of the cow Elk in front of him. Some of the cows heard the rock roll and quickly made their exit out of the open feeding area and back into the timber. As dad eased out into the opening towards a depression in the ground where a small weep was located, he saw the towering antlers. A mere 50 yards away the 6x6 bull fed in the small opening, oblivious that some of his cows had busted my dad making his way up the draw. The bull remained at 50 yards from my dad and within easy bow range for minutes until he realized that his some of his cows had gone AWOL. In a fit of panic, the bull circled in a 50-80 yard radius around my dad silently picking up the remainder of his harem and moving them into the timber in a desperate attempt to locate his missing cows. Even with the bull in frenzy over his lost cows, he did not bugle or make a single sound in his efforts to locate them. The photo below shows a magnificent 6x6 that had been living in that same draw during the summer. The bull my dad stumbled into just may be this very bull. I had picked the wrong draw to hunt on day four. Together my dad and I spent the day seeking out the 6x6 that he had encountered the day before. Unfortunately, we were unable to re-locate the herd and the massive bull. There is an old saying that if you are not discouraged then you are not hunting. Well I was definitely hunting and running out of precious time. The bulls had quit bugling, temperatures were high and optimism was becoming scarce on my part. I had to keep reminding myself that my luck could change at any moment. Dad and I spent the day checking wallows for recent activity and game trails looking for fresh tracks in an attempt to figure out what the silent and nocturnal Elk were doing. The only thing we found on day two was three other hunters. Go figure. During the heat of the day, Dad and I gathered up all of my trail cameras and tree stands packing them back to our spike camp. I would be spending the final day of archery Elk season solo as Dad was going to head out on the final morning to go back to town to get the mules so that we could pack out our spike camp the day after season. The weather was due to cool on the following day by some 20 degrees and I went to bed that night hopeful that my luck would change on the final day of archery season.